At this time of year they seem to be everywhere. With spring comes a blanket of green, creeping plants speckled with plump, delicious looking red berries. They look like a miniature version of strawberries. They also look like they’d be nice to eat. But are they edible? Are they safe to snack on? In the past I’d heard that wild strawberries are poisonous, but I’ve been wanting to know for sure what to tell the kids about these bright berries. Up until now, I’ve just been telling them I didn’t know if they are safe, so they weren’t to put them in their mouths. But after doing some researching today, I’ve discovered exactly what we needed to know. The short answer is: YES, wild strawberries are edible, and delicious, and even used for medicinal purposes! However… there are two types of “wild” strawberries: True wild strawberries, and “Indian Strawberries”, also called “mock” or “false” strawberries. Mock Strawberries were introduced from southeastern Asia and can be found growing wild in Japan, Indonesia, and China. They were originally brought to the United States as an ornamental flower, but soon became more of a weed species because they grow and expand rapidly, taking over everything in their paths. Wild Strawberries, on the other hand, are perennial herbaceous plants and can be found growing natively throughout much of the United States They produce long runners that spread easily as soon as they take root. These plants prefer chalky soils, or even those containing high levels of limestone. Wild Strawberries are unique because the yellow seeds on the outside of the strawberries are technically the fruit. Mock strawberries are not poisonous, but they don’t have any flavor to speak of. If you eat one you’ll be fine, but you won’t be very impressed by the taste left in your mouth. You might even spit it out for blandness. Wild strawberries, on the other hand, are delicious. They taste more like the strawberries you might pick in your garden or buy at the grocery store, though arguably better. Though they’re small in size, true wild strawberries are bursting with flavor. Plus, they’re extremely good for you. These low-calorie treats (only 45 calories per cup!) contain more Vitamin C than an orange, and are naturally cholesterol- , fat-, and sodium-free. They contain tons of folic acid and polyphenols and can even inhibit the growth of cancer cells. Wild Strawberries are smaller than their commercial look-alike, but they are actually sweeter as they ripen more quickly. They usually ripen in late spring or early summer and can be found in both undisturbed rural areas as well as more urban ones. Within the larger “category” of Wild Strawberries, there are three sub-varieties of these tasty fruits. 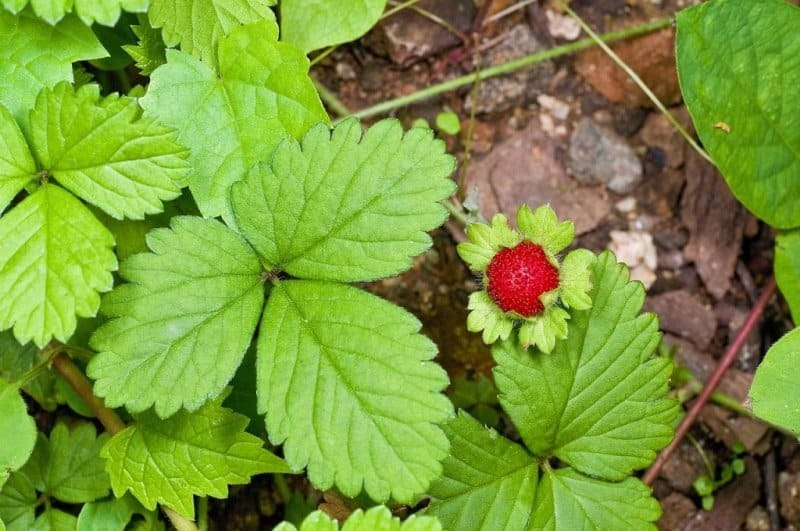 The Virginia wild strawberry is one of the most popular kinds, and has light green leaves with tiny, flavorful berries. The beach or coast strawberry sports dark green, shiny leaves. Its fruits are still edible, but not quite as sweet and distinctive as the Virginia. The woodland strawberry is normally found growing in moist, shady areas and produces large leaves and flowers, along with sizeable berries. Fortunately for us all, there are a few surefire ways to tell the difference between a true wild strawberry and it’s deceptive cousin. If you still can’t tell the difference, perform the crush test. Wild Strawberries will have a strong strawberry scent when crushed. Mock Strawberries don’t smell like anything when crushed. Not a bad smell, but not really any smell to speak of at all. You can also taste them. Mock Strawberries don’t really have any flavor. Wild Strawberries dangle on the vine. Mock Strawberries point straight up. Wild Strawberries will also have a slightly different texture than Mock Strawberries. They tend to be juicy and soft, while Mock Strawberries are hard, dry, and crunchy. When you bite into a Mock Strawberry, it will have a slightly bitter taste but an aftertaste that is more like a cucumber or watermelon. Both Wild Strawberries and Mock Strawberries grow along sunny banks, usually along a forest’s edge or another semi-wild area. These tasty treats are entirely edible and also rather nutritious. Wild Strawberries dangle on the vine. Mock Strawberries point straight up. So, armed with this new knowledge, I took my oldest daughter outside with me to a spot where we knew of some berries growing. Since there were no blooms on the plant, only berries, we went right to crushing them to test their scent. And we both agreed. No scent. Not true wild strawberries. Later on we discovered a patch of true wild strawberries growing among some dead tree stumps behind our house. They’re truly the most delicious strawberries we’ve ever tasted. It’s good to know that if the kids decide to put either one of these berries in their mouth, I have nothing to worry about. As a matter of fact, they’re both highly nutritious, and packed with vitamin C. Gotta love that! Wild Strawberries can also be used for medicinal purposes. Their leaves can be used, either fresh or dehydrated, as a treatment for digestive upsets and diarrhea. They can also act as diuretics and resolve issues like rheumatism and arthritis. You can crush the berries to treat a sunburn, or even take the berries as a fever reducer. Look at all of these miraculous health benefits! So how do you eat wild strawberries? Simple – you can prepare them in the same exact way you would eat cultivated strawberries, or don’t bother preparing them at all and just eat them raw as a tasty snack or dessert! I’ve used wild strawberries in jams, sauces, and fruit salad. They are also delicious on shortcake or pancakes, or even in muffins or other baked goods. The opportunities are virtually endless when it comes to enjoying these fruits, and while they pack the most nutritional benefit when eaten raw, they are good for you no matter how you prepare them. Another benefit of wild strawberries is that, because they grow wild, they aren’t treated with any of the chemicals you might find on store-bought cultivated strawberries. Yes, it may take more strawberries for you to have a snack that is as large and satisfying as that provided by cultivated strawberries, but boy, is it worth it! Do you have wild strawberries growing nearby? This was very interesting and informative. Your children are lucky to have such a good and sharing teacher. Thank you for the helpful information on wild strawberries. In some areas such as next to roadsides or bike paths, there may be an unseen effort to control weeds with herbacides. I’ve read that some types herbicides are not meant for food crops and maybe used in these areas. It may be worth adding a cautionary note about that in this article. Those are “snake berries” and they are poisonous. I eat them all the time, wonder why I’m not dead. you need to do more research. perhaps you were misinformed or your plant is something else. I honestly never knew there was such a thing as mock strawberries. Growing up in New Brunswick (Canada), we had tonnes of wild strawberries growing around our property in the countryside, and I have great memories of grazing on them like a black bear fattening up for winter. lol Unfortunately, having moved west to Alberta (north of Montana), I’ve never seen them here, which is truly a pity. They’re small, but incredibly tasty. can you possibly have anymore annoying slow to load ads on your website. Don’t be rude due to your slow internet connection please, mate. I was worried, I’ve always seen them growing in the backyard, but lately, I noticed “leaves of three” and thought it was poison ivy growing. How do you tell the difference between these and poison ivy? They look like poison ivy leaves, maybe a little smaller, but I’m no expert. It’s only recently that I became allergic to poison ivy, so I’ve been more careful. Can you help me out here. I too AM worried because of the “leaves of three!” My property has always had poison ivy, and this year I discovered we now have poison oak, so when I saw whole sections of my yard COVERED with this, I freaked! There is literally so much that it’s hard to find places to walk that are not covered! It was way too much for me to pull (which I usually do with the poison ivy), and in the 95-100 degree weather we’ve been having in NJ, I wasn’t about to cover myself in protective clothing to do this! I also don’t use poisonous products like Roundup, because I have feral cats and other wildlife that I don’t want to harm. But accidentally, I discovered this natural cedar oil product that I use to repel bugs, kills poison oak and poison ivy (roots still live though), so I began running around my yard spraying every creeping “3-leaf” vine I saw! Today however, I saw that many of them had a tiny red berry, and upon closer inspection, it looked like a tiny strawberry, and here I am! I have no idea where the heck they came from overnight, but I suppose I will stop trying to kill them! Poison ivy has a shiny green leaf that turns bright red in the fall. Strawberry leaves are dull green. You need goats! Goats love poison ivy. As a side benefit, I was fed goat’s milk as an infant and I acquired their immunity to poison ivy. I can roll around in the stuff. Some people use them as garnish in salads. I will, however, let the grandkids eat those that are growing in my yard. When I was a boy growing up in the Maryland suburbs of D.C. we used to pick wild strawberries in the woods ever year in early June. We’d fill 7-Eleven slurpy cups with them and make strawberry milkshakes. They were great! Now, years later, I live in Virginia near Dulles Airport. I’ve looked for them along nature trails near our house, to no avail. They’re not anywhere to be found! Are there areas where wild strawberries just don’t grow? Could the soil here be too rocky or have too much clay in it? Do you know where I can find a map or description of where wild strawberries grow locally? I have seen the so-called “mock” or “Indian” strawberries here, but didn’t know they were edible. Maybe the next time I see one I’ll try it. I wish I knew the answers to your questions. Maybe somebody else will chime in and help. I’m sure there are places they don’t grow, but I would think Virginia would be a suitable environment. We have clay soil here and they seem to love it, so that must not be much of a factor. Good luck in your hunt! Kendra, where I live in Virginia there are both kinds of wild strawberries all over! My yard is full of them, maybe it’s because I live near the beach where the soil is more sandy? I live in Virginia where there is no sound and these are in my yard. It’s a relief to know the mock strawberries are edible, because my three-year-old just ate a few!! Strawberry plants are very sensitive to weed killer and lime. 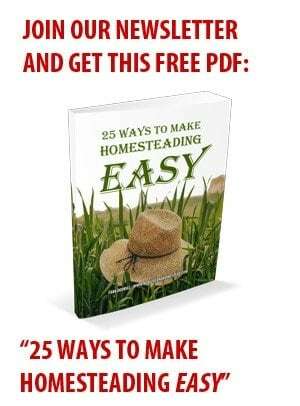 This I know from having a backyard garden and using lawn products on adjacent ground. I would expect the Wild variety to also be very sensitive to these common lawn products. This may explain why many areas are devoid of wild and mock strawberries. I live in rural Alaska 95 miles north of Anchorage as the road meanders. I have wild strawberries in my yard which is very rocky. I just discovered how many there are as they are on a slope mixed in with many “weeds”. Awesome, Jan! They seem to grow everywhere! AQuestion: Canyougrow “Wild” strawberrieswith “Domestic” strawberries with out losing the indavidual qualities of each? Bob, I’ve lived in Sterling and Fairfax and seen them my yards – very little though. I live in Southwestern Virginia and they’re everywhere. I’m wondering if being close to the airport and the fuel have something to do with them not growing where you live. I grew up eating so-called “mock” strawberries with the pretty yellow flowers (we called them wild strawberries). I will admit, some of the smaller ones have no flavor or a vegetable taste, but if they have good growing conditions, the big juicy ones have a subtle sweetness and hint of berry flavor that my family has enjoyed for generations. My cousins and I used to collect them as kids and make sweet, tasty jam out of them, because in the fields at my grandparents’ house they grew large and unfettered. Some of the berries were as large as a blackberry and a vibrant, garnet red – those were the tasty ones. Those other ones you posted are what we called wild raspberries. This was very helpful! I’ve always wondered if the wild strawberries in my backyard were edible. My kid’s have always been wanting to try them but i heard rumors that they were poisonous so i didn’t want to take any chances, now i know that i don’t have to worry and will let my children eat them freely. Thank You for this information :). It is always a good idea to reference reliable resources for information on wild vegetation. A National Wildlife and Forestry Commission or Library are good places to begin. This site provided the best information I found on mock strawberries. It was clear and concise. Did not leave me with a puzzled, frustrated feeling. Thank you for helping us learn more about our environment. Glad to know the difference now! Mine are mock but just as nutritious so they’re on my cereal this morning! Don’t understand the commotion about Wild Strawberries. They are VERY COMMON in Europe and jams are made from them as well as juice that is added to tea. I find it odd that we can’t get them here in the States. I showed mock strawberries to my 3 sons last year, and we ate them. No problems. True enough, they are tasteless. BUT, in a survival situation, you are eating to live, not for taste anyway! Then, today, eldest son comes at me waving a survival book I bought them with pictures and captions of “poisonous fruit,” and it says on page 89 that the Duchesnea mock strawberry (picture included, berries pointing upwards) is poisonous, “can be fatal!” No wonder people are confused. And, this author got the false info from some other false publication. The book is “The Complete Wilderness Training Book,” by Hugh McManners, 1994, 1998. I don’t like it when erroneous books make my kids think I’m a dope Dad. When I was younger, myself and my friends would eat anything wild. I’m surprised we didn’t poison ourselves, but we were lucky. Our river had a long earthen levee for at least a mile or so, and in the Spring, it’s was covered with wild “fake” strawberries. We certainly tried to eat them but they were worse than cardboard, yuck. We did find wild white peaches, blueberries, blackberries, dewberries, plums, gooseberries, elderberries, mulberries, grapes, persimmons, apples, wild tomatoes, wild cherries, nuts, acorns, honeysuckle, violets, dandelion greens, poke salad, sour grass, maypops, wild onions, thorny oranges, bamboo shoots and crayfish in the little creeks and streams. We never found any real wild strawberries except where someone had an old abandoned patch. It’s no wonder we were so healthy then because we certainly ate plenty of wild food. There were several wild melons around, but we were told not to eat them because they’d make us sick. People said they were volunteers from the melons farmers had planted for their pigs and livestock. Of course we tried anyway, but they were bitter and we couldn’t get enough down to make us sick, I guess. Thinking back, it’s amazing how many edible foods we found while foraging in the fields and woods in our native Georgia. We were “country” kids and in summer we left the houses in the morning and didn’t return home until supper time. Our parents were not afraid for us when we were all together, our little band of neighborhood kids. I suppose they were right, because we’re all still alive, so that’s something, right? Interesting comment about the melons. Last year I planted yellow squash and zucchini as I usually do. Also, some wild gourds sprouted and grew nearby. I knew as a kid my mother had always said not to plant different gourd or melon plants close together as they could be cross pollinated by insects. However, I never had a problem until last year. One of my zucchini plants produced squash that was the color of zucchini but bumpy like my yellow squash. I cooked it anyhow and ate about two tablespoons of it before I had to throw it out due to the horrible taste. A few hours later I was very sick. Ended up staying in the hospital for 4 days due to severe bloody diarrhea, vomiting, and dehydration. Was diagnosed as Food Poisoning but no tests were done to check out the squash as being the culprit. Discovered online that a few states had an outbreak of this nature a few years back due to bad squash. So BEWARE. Oh wow, Linda! I’ve never heard anything like that. Very interesting. I am now thinking about pulling out the squash that is planted in my garden. I have peppers and tomatoes and cucumbers planted also. I know those are not other melons or gourds but I am always worried about food poising. Loved your text! I didn’t know there were so many wild foods!! Sounds like a wonderful childhood! Thanks for sharing. Awesome wholesome STORY about nature. Thanks for sharing. this was very interesting. I had always wondered if the wild strawberry (with the white flower) was edible but was afraid to try it. I have lots in my yard and will now try one of them. Have a few of the yellow flowered ones too but will leave them alone. Thanks for the info. The little red strawberries I have growing in my flower bed must be mock strawberries. After reading all you had to say about them we tasted them and my daughter says the have a wild taste and taste more like green leaves might taste. Haven’t tasted them yet myself but my taste and smell left me a couple of years ago so I probably won’t be able to have an opion. I am new to Alabama and found this darling red mock strawberries poking up along the greenway trail. Two locals told me they were ‘poisonous,’ which I refused to believe. I like the name snake berries and the idea of infusing honey with them–I’m sure it will be beautiful! I was born and raised in the country where we were taught at a very early age the difference in wild edible strawberries and false strawberries we referred to as “snake berries.” Picking wild strawberries, black berries, muscadine grapes and wild plums among other fruits was important, as these were future preserves, jams, jellies and fresh pies. etc.. Also there was a lot of home made wine. I don’t suppose most kids now days would get a thrill from hunting and picking thes delicious wild friuts. Although I’m quite sure they would enjoy the pies, tarts, home made strawberry ice cream and other delights. I have both real and “fake” wild strawberries growing in my yard. The real ones have light colored seeds on the outside, and the fakers have red seeds that protrude from the outside. The blossoms are different colors too. Thank you for the information!! !I just moved here and now know the ones across the street are PHONIES,(so I was afraid to try one, didn’t want to be pushing up daisies tomorrow!! )Glad I know they are not poisonous, but , still won’t eat one anyway. I like taste not tasteless foods. Again, THANKS FOR THE INFO!!!!! Don G. in Pa.
They’re perfectly edible, but yes they have a mild ‘vegetable-ish’ flavor with a hint of berry-like scent. They’re not sweet or even tart like cultivated strawberries. The seeds are nicely crunchy though. You can put them in a bowl with a few spoonfuls of honey and stir them up though, or throw them on a salad or a bowl of ice cream as a garnish. This is what my dad taught me. Snake strawberries have a bumpy texture like little hairs growing from the berry. I was told to never eat these. A wild strawberry looks just like the big ones you buy at the grocery store or pick at a strawberry patch but is very small. Actually to me they are sweeter than the larger ones. Mock strawberries are safe, but totally tasteless. Instead of eating them by themselves, chop them up in a salad. Another way to tell the difference. “Fake strawberries” face up, showing their bright red faces. Real strawberries dangle down and can be harder to see. I found a small patch of them in my yard. I’m confused though, people keep saying the mock strawberries point up and the wild strawberries hang down. The ones in my yard did not hang down, they were a beautiful red color, and were sweet, with a definite strawberry flavor. Maybe a different variety then? Interesting. We’ve only ever found the mock strawberries. I always thought they were wild strawberries but was disappointed by the fact that they tasted like nothing. Thanks for the info! Too many people say something is poison just because of ignorance, and people wonder why we are so disconnected with food when we go and say everything we see growing wild is a weed or poisonous. Thanks for the information! It’s good to know! This is such a great post! I have wild strawberries growing all over my yard, and I tried eating one and it was not good. I decided that wild strawberries must not taste good — but my plants have yellow flowers, so they must be the fake kind! I’ve been eating wild strawberries since I was a kid and probably was eating “fake” ones too and I’m still alive! I’ve never heard they were poisonous. We have these in our backyard and everyone tells me that they’re poisonous too so I’ve been wondering this also! According to “Nature’s Garden: A Guide to Identifying, Harvesting, and Preparing Edible Wild Plants” by Samuel Thayer the mock strawberries aren’t fit for human consumption only because they are almost tastless. We can attest to this – my sons eat the ones in our yard occasionally but mostly they like to pick them to feed to the chickens. we dont have them in our yard, but when I was little one of my grandmothers houses had them, we always called them “snake berries”, and we were always told they were poisionous too. the bad ones are small, little miniature looking. I wonder if true wild strawberries are small or big like regular strawberries? Nice to know. I’ve grown up seeing the little berries on my grandmothers farm and in the woods but I never knew there were two kinds. Thanks for the helpful tip!